1. 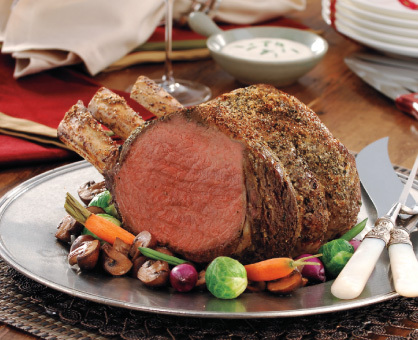 Prepare Beef Rib Roast: Preheat oven to 450°. In small bowl, combine salt, thyme, garlic powder and pepper. Coat all sides of beef roast with salt mixture. 2. Place beef roast, fat side up, in large roasting pan. Roast beef 20 minutes or until outside is browned. Reduce heat to 300°. Roast 1 hour 30 minutes to 1 hour 40 minutes longer or until internal temperature reaches 130° for medium-rare. 3. Meanwhile, prepare Horseradish Cream: In small bowl, whisk together all ingredients. Refrigerate until ready to serve. 4. Transfer beef to cutting board and let stand 15 minutes before slicing to let juices set. Roast beef an additional 10 to15 minutes if medium to medium-well done meat is desired. It’s very important to allow the beef to rest before slicing to prevent the juices from running.